On the eve of my youngest son's move 2,575 miles across the continent from Ottawa to Seattle, I sat down and watched Everybody's Fine. Judging by how I felt afterwards, that turned out to be a mistake because I thoroughly related to the characters in the movie. Because of my current family situation, I was particularly empathetic with the father figure as played by Robert De Niro. However, the film also made me feel for my father and my childhood family dynamics. Everybody's Fine is real tear jerker. I was definitely one of those who sobbed their way through the movie, which is not my norm. According to other pieces I have read, I am not the only one who sobbed their way through this film. The story? Dad has lost his wife and has now taken on her roll of trying to hold the family together. I don't want to say more for fear of spoiling the story for you but I will say this movie comes HIGHLY RECOMMENDED by me. If you are an empty nester or becoming one, be sure to have a box of tissues at hand. Take a peek into the movie here, in the movie trailer. 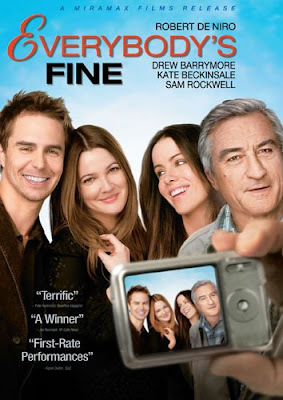 Everybody's Fine also stars Drew Barrymore, Kate Beckinsale and Sam Rockwell. It received mixed reviews and the late critic Roger Ebert said the acting could have been better. I think I agree with regard to the supporting cast. However, I think De Niro's performance was pretty good. The Guardian says about De Niro's performance: "His calm, careworn, less iconic and more human face is restfully presented to the camera." They go on and call it a "refreshingly open, untricksy performance." They close by calling the film, "fine." I agree. I think that if you are able to relate to the father figure you will enjoy Everybody's Fine. Be aware that it will pull on your heart strings and that it is sad. I think it does a very good job of sharing a situation that many people, like myself, find themselves in. Hopefully, we will be able to stay close to our children, wherever they wind up living. Have you seen Everybody's fine? Are you interested? Buy Everybody's Fine on Amazon. "Fine"-ally, a movie I've actually seen! I enjoyed it very much, though it did frustrate me to some degree, wishing family members would just be honest with each other. Not sure it would have been as realistic, though, if that were the case. While it was somewhat predictable, there were still surprises and I was pretty satisfied with the ending. I did learn, if I didn't already know it, that I don't call my dad often enough. Great review, Brenda!